Recently I read 13 Things I Want American Christians to Know about the Stuff You Give Poor Kids by Rachel Jones. Though she used the program from a specific Western ministry as the launching point for her article, I believe she made some excellent general points about the way we (American Christians) engage in charity/ministry among the poor. I do not wish to rehash the article here, but I encourage you to go and read it. You may not agree with her on every point and some may struggle with her approach. However, I encourage you to prayerfully consider her points as my experience has demonstrated that her arguments hold a great deal of merit. Ms. Jones’ first point about giving gifts to needy children robs their parents’ dignity resonated with me. I am familiar with a noble ministry that seeks to provide Christmas gifts to the children of incarcerated parents. Their desire is to show the children that their parents love them and to help preserve parent/child bonds. In practice, well-meaning Christians buy gifts for the children and often personally deliver the gifts. This is the part I never understood. If the goal is to strengthen the bond between parent and child by providing a gift that is supposed to be from the incarcerated parent, then delivering the gifts is totally counterproductive. Children are not stupid. When total strangers, often of a different ethnicity and socioeconomic class, show up with over-the-top gifts the kids know they did not come from mom or dad. In the end, well-intentioned Christians, giving out of a spirit of generosity, actually undermine the bond between parent and child rather than strengthen it. At best, this happens as a result of lack of understanding and, at worst, from a need on the donor’s part for gratification. Secretly giving a humble gift to the child’s guardian to be given to the child from the incarcerated parent would be much more effective in strengthening the bond between parent and child. It also shows respect to the position of the guardian and would be a more effective platform for sharing the gospel with them. At Living Bread Ministries we have adopted the approach of equipping insiders to help one another in their own community. When dealing with severe poverty it is pretty hard to hide the fact that outsiders are providing resources to meet basic needs in the community. Typically, this is done by Western humanitarian agencies who setup feeding centers, schools, orphanages, etc. These organizations see needs and they rightly mobilize to help, however they unintentionally relegate the locals to the sidelines. Local agencies and churches cannot compete with the large budgets and modern facilities these outside organizations have. Living Bread exists to establish indigenous local churches among the global poor. We come alongside these local bodies of believers and help them implement their own programs to meet needs in their community. Rather that relegating the local church to the sidelines, we help them take a lead role in blessing their communities. For example, when food is distributed the financial resources, in part, come from Western donors, but the food is purchased locally and distributed by the local church, neighbor to neighbor. In this scenario, the community as a whole is strengthened and Christ is glorified through the local church. Over the years I have witnessed some of the most kind and generous people cause unforeseen harm to people they sincerely want to help. I have seen an entire youth group splintered–and to this day several of them have abandoned the church–because a well-meaning Westerner gave a gift to one youth and not the others. It was not maliciously intended, the Westerner felt a connection to that particular youth and wanted to be a blessing, but the end result was catastrophic for the church. Had the gift been left behind for the local church to handle the problem probably could have been avoided. Another area where Living Bread partners with the local church is through our annual Share Christmas project. 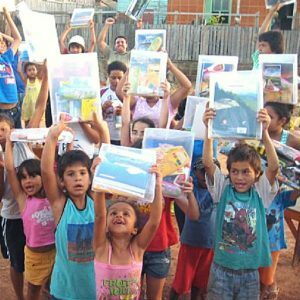 Since most of the children in the communities we serve cannot afford basic school supplies and uniforms (where required for school attendance), we help provide these materials in order to help ensure children receive and education. We raise $15 per child which is sent to local churches in Brazil, Thailand, and Cambodia. The church purchases the supplies locally and distributes them in their own community, neighbor to neighbor. Everything is in the native language and is seen as a gift from the local church caring for their community. In all honesty, every year we struggle to meet our goals for this annual outreach. I believe, in part, the reason is because the average donor would rather go to the local department store and spend twice as much on items to send. I get that. It feels a lot better than giving $15 online. However, by equipping the local church to be the hero, rather being the hero ourselves, we actually make a greater and more lasting impact. Click the links to give to our Share Christmas or Feeding the Hungry initiatives.